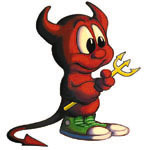 Just a quick post about a FreeBSD problem I solved, for what it may be worth. A quick Google search showed it was a hard drive related problem, which was strange considering the drive had been operating just fine. After much head scratching, I determined the relatively crappy PSU simply couldn't take one more peripheral, so I upgraded it from a 350W to a 450W. FreeBSD now detects and boots from the hard drive just fine, and my FireWire PCI card works. Lesson learned: if you encounter the above error it's most likely the result of a recent hardware addition, and that even though a hard drive error may be a symptom, it may not be the cause. That counts as that whole Lateral Thinking thing, right? Older post → Australia to record browsing history?